This January 2014 I want to start off by wishing Celia from Fig Jam And Lime Cordial and her family, an amazing year! Thank you for inspiring us each month to share with you what is new in our kitchens. This month I start with what is new in my garden! I was given a fantastic food hamper from Pick N Pay in anticipation of the opening of their new store at the V&A Waterfront. The store is amazing and so worth a visit, if not for the gelato at the entrance or the great tea and coffee bar, then for the fresh duck and rabbit! I used the box from my hamper to plant my tomato seedling into and hopefully I will have an abundance of tomatoes. Dave has taken to making open omelettes for breakfast and our omelette pan is not very suitable for the oven as even though it fits in quite nicely, it does not sit in the centre due to the handle. Dave wanted a small round pan and I gave him this braising pan as a Christmas gift. It has a lid which means I can use it for casseroles and it has been tested with an open omelette made with leeks, tomatoes, asparagus and feta and works excellently. I was given a gift voucher from yuppiechef and I decided to use it to buy the salt cellar to go with my pepper grinder from Le Creuset. I must say that my table looks really good now with these beautiful cherry adornments and they work well! Last December I gave my Bennet & Read automatic dustbin too much of a good clean. I broke the mechanism which automatically lifts the lid when you wave your hand in front of it. 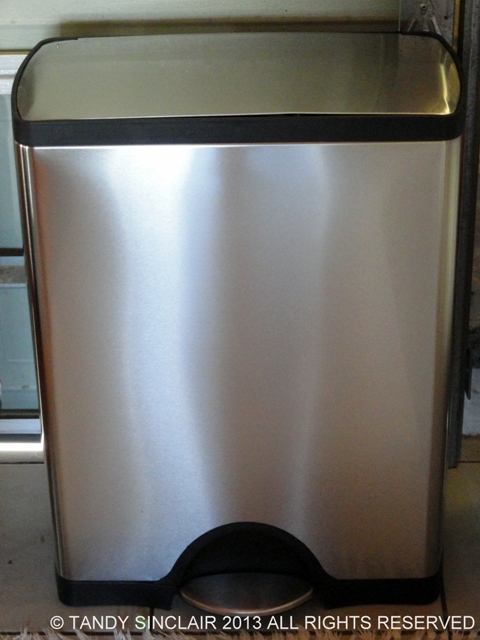 I finally decided to get myself a new dustbin and chose a rather large one! It has a separate holder for recycling which is perfect. The lid also locks open making changing the bag really easy, and the bag hides away inside the bin. It is meant to be fingerprint proof as well! I have moved the old dustbin into the scullery to take the recycling as we need all that extra space. I am still obsessed with bread making, even though my starter is in the freezer. I placed it there for ‘safe keeping’ before we went to Italy and I have not had the time to make bread since then. 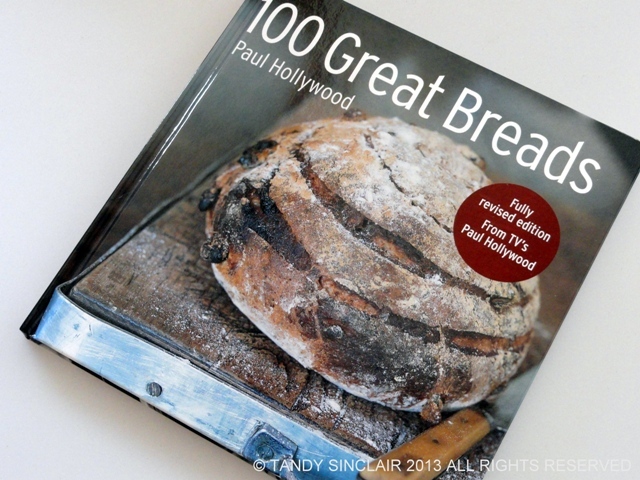 But I have been watching the very dishy Paul Hollywood bake bread on TV and so I decided to buy his book as a Christmas gift to myself. Sadly it does not have his recipe for stollen in it which I wanted to make as a gift for my mom. I have come to rely on my Kitchen Aid Artisan Stand Mixer a lot. It is so easy to use and so easy to clean and I have a lot of attachments. But, I think the newest addition is going to be the best one yet. It is a flex edge beater which means that the ingredients get scraped from the edge of the bowl as it is beating. I have not tested it yet but I am sure looking forward to doing so when I get to bake while I am on leave. A few months ago I attended a bread making course courtesy of Taste Magazine. Not only did we learn a lot about bread, which if you follow me on twitter you would have read about already, but we also got to do a charcuterie and beer tasting. The beers were from Triggerfish Brewery which is owned by Eric. Eric gave me some stout to make my chocolate stout cake which Taste Magazine featured in their December copy. I was so chuffed to see my recipe professionally styled. Catching up on posts I missed over the holidays. This made me laugh because I also give G gifts for the kitchen I can use myself! I thought that was such a clever thing to do! Lovely post, as always!! 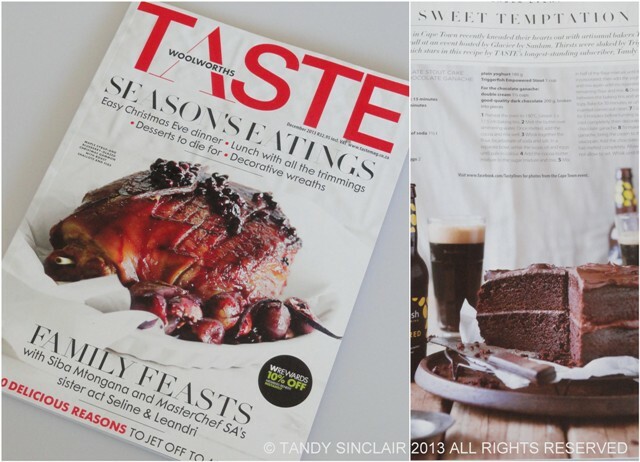 Congratulations on being featured (again) in the Taste mag! I have a bread starter in my freezer as well…maybe I will now find the inspiration to make bread again. Lately I have been making buns with fresh yeast with my kitchen aid…they are fairly quick and tasty but nothing beats a loaf of bread made with a yeast-free starter. I love your new attachment. Happy New Year! I love using my Kitchen Aid to do all the hard work! It is really the best thing! Kitchen Aid accessories seemed like a very popular Christmas present. I’ve seen quite a few posts and comments on Twitter. As to Paul Hollywood…I had previously looked him up to check if that was really his name (it is). We see him here on the Great British Bake Off and I have to say, I like him and his northern accent. Keep on baking! I look forward to reading throughout 2014. The flexible mixer paddle looks so useful! I need one of those! I am wondering how I made do without one! Your bin is big and beautiful and just right in my opinion. I like the no fingerprint finish- mine always needs to be wiped down. And the kitchenaid flex blade look great- I want one too! 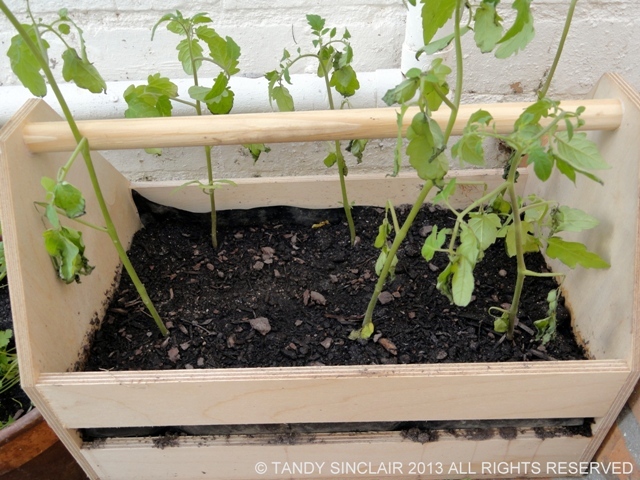 I love your wooden carryall crate with tomato plants in it- that is exactly how I would have used it! Tandy, Happy New Year and thanks for sharing your omelet combo — sounds like a happy mix of flavors. The braising pan looks great! 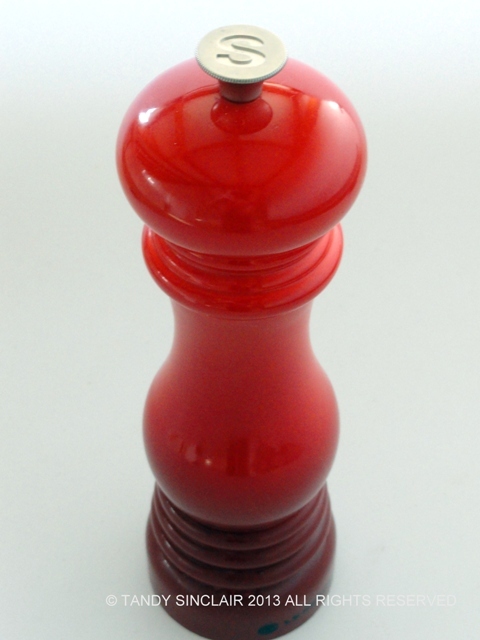 The pepper grinder in red is such a perfect accessory to the table! I want one of those beaters too. 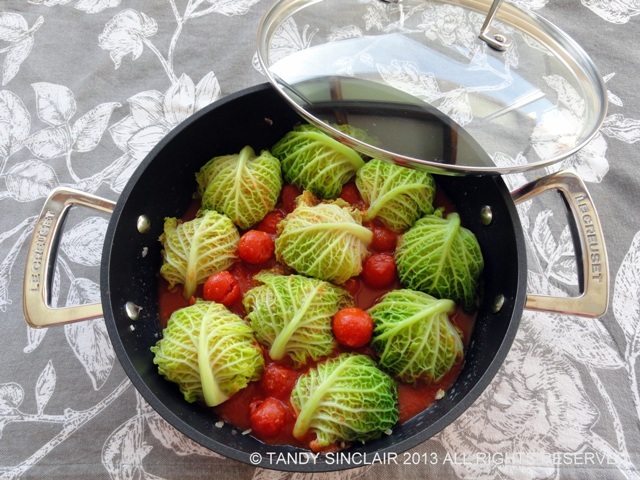 But even more I want your recipe for stuffed cabbage leaves – those look amazing. Happy New Year. G’day Tandy! Happy New Year, true! May it be the best one ever too! Tomatoes and tomato plants always make me smile…remind me of dad, now passed away! Thanks you also for your enjoyable kitchen view today! Thanks for the visit Joanne, I am hoping for an abundance of fresh tomatoes soon! Happy new year Tandy…. I like the sound of that beater… wonder if it would fit onto my appliance, which isn’t a Kitchenaid, but isn’t dissimilar. Happy baking and all the best for 2014. Tandy stollen is my new Christmas tradition, I’m completly hooked on the stuff and only wished I had made three of them this year…actually on second thought, maybe it’s best! Happy New Year Tandy. You have wonderful treasures in your kitchen again this month, I especially love your new bin! Happy New Year to you. did you enjoy Paul Hollywood’s bread show? My hubby being a baker snorted his way through the first episode and so I never got to see the rest! it is so worth getting one! That beater looks awesome!! No more stopping the mixer to scrape the bowl! And it works, which really helps! Hi Tandy what a great way to start the new year – cookbooks, goodies and gadgets! You have a scullery! The last person I knew who had a scullery was my grandmother. What do you keep/do in it? The flex edge beater looks an excellent idea. I love the wooden box you got your hamper in! Gorgeous!! Thank you for a peek inside your kitchen. A happy 2014 to you, your loved ones & your cool blog, dear Tandy! and the same to you Sophie! I’m going to have to look into that beater…it sounds like a great idea. Hi Tandy, that beater looks like a great idea. You will have to report back on whether it works as good as it looks. Love the series “In my kitchen” for several reasons: curiosity above all as I like to see what others buy and use in their kitchen, and I am very tempted to have a go at it. The flex edge beater for instance, how often do I have to manually assist my mixer instead of the other way around! We have a stollen recipe in the family, tell me whether you would like to have it and I will send it to you. Have a wonderful January 1st!